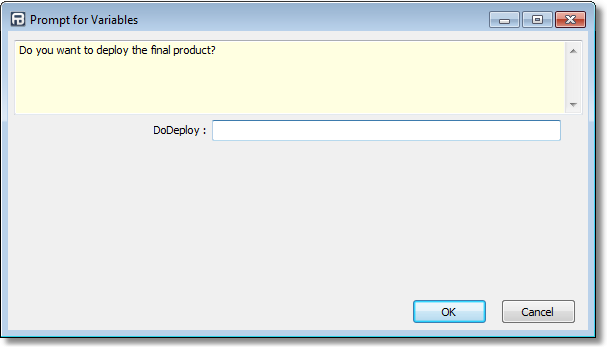 This action allows you to prompt the user for variable values at run time. 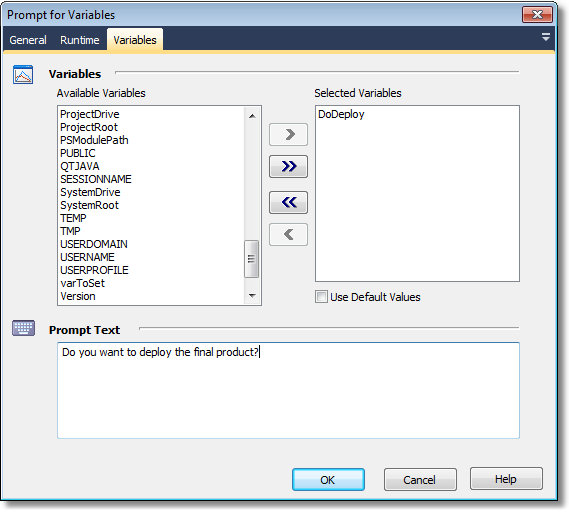 For more information on variables, including creating your own project and user variables, see here. Note: This action should not be used unattended, as it will cause them to hang waiting for user input. By default, interactive actions are not available from the FinalBuilder console. Interactive actions cannot be used inside Async Action Groups. For more sophisticated prompts requirements, use the Prompt For Variables (Enhanced) action. Use Default Values - fill out the variable value at runtime with the default value of the variable. If this option is not selected, the variable value will be blank. At runtime the above configuration would cause this form to be displayed when the action executes.